100% WATERPROOF & THERMAL – The Cool Cat is the Swiss Army Knife of cooler bags. Use it to keep contents hot or cold, as a padded protective case for your camera or other valuables, or for any situation where you’d use a regular dry bag. 12 L capacity comfortably fits 12-16 cans, with ice, when fully closed. DURABLE – Don’t let the silky soft feel of the ‘Nylon 66’ Fabric fool you – this is one tough cat! Durable fabric + TPU coating + Heat-taped seams + Thermal foam padding + Internal liner + Adjustable and removable shoulder strap = The best thermal cooler bag on Earth. COMPACT & LIGHTWEIGHT – No need to carry around a bulky hunk of plastic anymore! 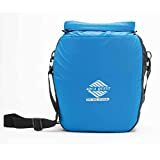 This foldable cooler bag can compress down to 12 x 5 x 2.5 inch (30 x 13 x 6 cm), so you can tuck it away anywhere when you’re not using it, and at a featherlight 15 oz (420 grams), you won’t even notice you’re carrying it. MORE USEFUL THAN A REGULAR CAT – Compared to any other cats that Aqua Quest tested, the ‘Cool Cat’ was infinitely better at keeping your drinks icy cold and protecting your valuables. Furthermore, the Aqua Quest ‘Cool Cat’ won’t throw up on your floor, pee on your sofa, or bring home any rodents. The Cool Cat is an innovative and refreshing new product from Aqua Quest. Use it as a thermal cooler bag, padded camera case, reusable grocery bag, picnic basket, or multi-purpose protective dry bag. Think ‘beers on the beach, snack in the car, or picnic on the fly’. Easily holds 12-16 cans with ice, or even a hot lunch for several people. Ultra portable, and without the bulky size and heavy weight of a traditional plastic cooler. In fact, the only downside to the Aqua Quest Cool Cat is that you have to buy your own drinks!